People come and go at work and along with them go their plants. I saw one such plant in the lobby waiting for its owner to pick it up and said to myself, "what an unusual plant the segments look like bottles". Later when I game back to ask the owner the name of the plant it was gone. I looked at the vacant window sill it had been sitting on when I spotted a small green segment two cm long, dropped from the plant as it was being taken away. I took it back to my office, put some potting soil in a plastic fruit cup with a lid, planted the segment and hoped. Success! It grew into a Drunkard's Dream or Hatiora Salicornioides. The resulting plant so far does not seem quite true to mom. Close.....but the segments are not bottle shaped, even though the original segment had a bottle shape. See pic. 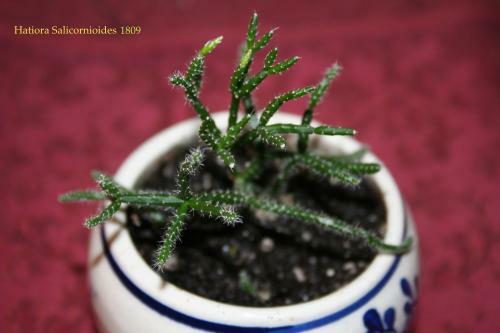 It has a cousin Rhipsalis gaertneri which had a similar issue. As the plant matured it developed into the expected plant. I guess i will have to wait. I have had mine for @ 5 years now, they are so easy to take care of and love how it keeps having more little ones. It will eventually look like Mom, as it matures. They let you know when their bottles are empty:-) No seriously, they wither a bit when they do not have enough water.